My friend Danielle at ProfMomEsq invited me to an event on FB that I thought I would share with you. 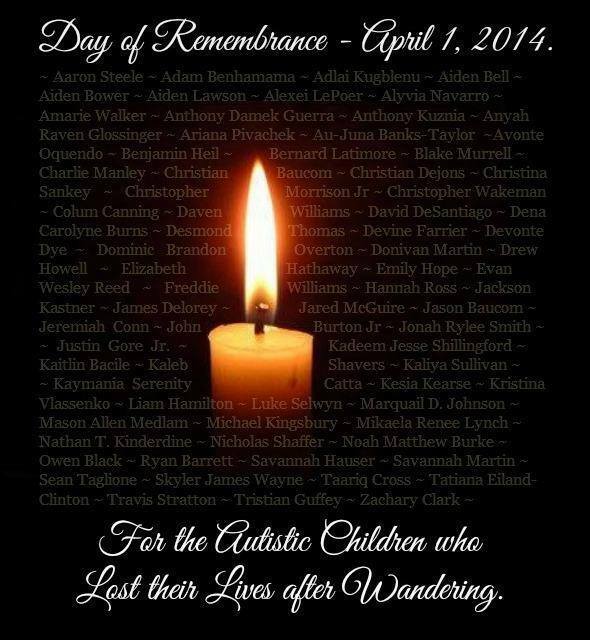 This event is a virtual candlelight vigil to remember and respect the lives of autistic children who have died after an elopement. The Kennedy Krieger Institute reported in a 2011 study that up to 48% of all children with autism will engage in wandering behavior or “elopement,” which is defined as the tendency to leave a safe space and enter into a potentially dangerous one, and is a rate 4 times higher than their neurotypical siblings. I can’t even imagine what it feels like to lose a child. It is even harder to imagine what it feels like to worry about your child wandering off. Please send a little prayer, positive energy, good thoughts — whatever it is you do — to the families who have lost someone precious.